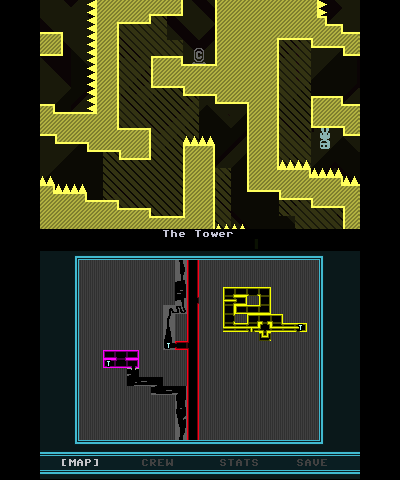 VVVVVV (say the letter V six times) is a Commodore 64 inspired indie puzzle platformer design by Terry Cavanagh, originally for the PC back in 2010. Since Nicalis has found success in bringing critically acclaimed indie PC games to downloadable console services (I.E. 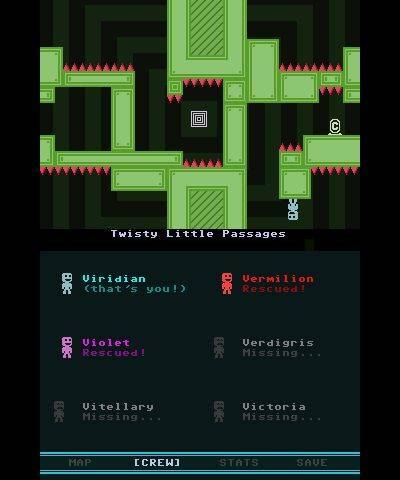 Cave Story) they are giving the same treatment to the dimensionally stranded emoticon people of VVVVVV, bringing it to the Nintendo eShop. This creative platformer abandons the norm of jumping from one platform to the next. Instead, you play as one of the Vs who can invert gravity. With a press of a button, the V metaphorically falls from the floor and lands onto a spike-free ceiling. Pressing a button again will have him fall right back down to the actual floor. The gameplay mechanics and the retro PC graphics style are both refreshing in terms of presentation and challenge. 'Start Game' begins the main story mode. You play as Captain Viridian, who must find his lost crew members who went missing after an incident involving their ship that teleported them throughout an alternate dimension. Luckily, each missing crew member is located in an area that requires you to master different ways to maneuver. Once found they are a screen away from a portal which will automatically save your progress once touched. There’s no way to contact your crew so you must find them the hard way by exploring the open hub world with the aid of the helpful bottom screen. Each screen represents a singular palette-weaving path. A masterpiece of design thats reminensent of what you would have found on a floppy disk. There are checkpoints that are also used to manually save your progress. If you touch any of the abundant spikes or a moving hazard, it counts as a death and you will instantly be sent back to the last checkpoint. Expect to endure hundreds of deaths in your first playthrough. Even just entering a part of the map that you haven't explored before can lead to instant death. 'Player Levels' are multiple side-games minus the autosaving portals and hub world. These games are where the simplistic stereoscopic 3D is more noticeably effective thanks to less use of negative backgrounds, along with claustrophobic level designs. The levels are given in alphabetical order but in this case that seems completely random as the levels range from insultingly easy (VICTUALS) to infuriately difficult (A NEW DIMENSION) and in-between are all sorts of short bursts of architecturally creative challenges. Both modes can be experienced in multiple styles and your choice of various preferences. In the ACCESSIBILITY OPTIONS, there is a choice to remove animated backgrounds and flashing screen effects. There is also an option to be invincible and be able to walk on spikes, however, if used too long, it leads to glitches, so save if for only when you truly need it to advance. The last option choice is to change the default game speed to a slower and more manageable experience. Seriously, the default speed is not for beginners; I also suggest avoiding the slowest speed as it creates lag in the videogame. There is one gameplay mode to select from the main menu that first needs to be unlocked; FLIP MODE, where the entire game is rotate to 180 degrees. Most of the achievements are from the main story mode. Once unlocked, 'Secret Lab' is where all the available achievements can be viewed and holograms represent accomplishments. In story mode, there are collectible Trinkets that unlock the game’s vigorous chip-tastic soundtrack and can be listened to at anytime in the game. Collecting all the Trinkets in one of the Players Levels earns you 50% completion and two “star” keys next to the level’s name defines as a 100% completion. These achievements really shows the game's boldness with the amount of content that will surely take a lot of patience to collect when using the Slide Pad. Good luck reliving the main retro circus act in fewest deaths as possible. There are some poor design choices with the menu. For example, there’s an option to unlock levels of the game you haven't played to yet. But the mode is becomes available without warning and with the simple press of the button you can inadvertly turn it on. It's not clear how it's activated or how to disactivate it other than by clearing your game data. Another poor design choice is the game forces you to go to the ACCESSIBILITY OPTIONS to bring everything back to default which is required to be able to play the "Time Trails" and "no death mode." This is simply tedious and unnecessary. You should be able to select these modes without the need to change the player’s preferences. 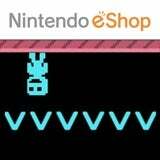 VVVVVV is an excellent addition to the Nintendo eShop. While this game does make great use of the duel screens or the 3D effects, it is still a game deserving of a wider audience. It won’t be surprising if Nicalis is planning to release it on the Wii U eShop as well. 9- Awesome - This game has little in the way of flaws, and is a highly enjoyable experience. I like our new review format alot, but now that we've changed to a universal review format we should start editing the other reviews to look like this, so our website looks more professional. We don't have to do it all at once, just a few at a time until they all have the same new format. Booya! Love the new review layout. I don't see what's so special about this game, but nice review all the same. Might be worth a download sometime. I think this review is very good. I just downloaded this, while it was the, "Game of the Week". I haven't played it much yet, but I can tell I'm going to enjoy it. 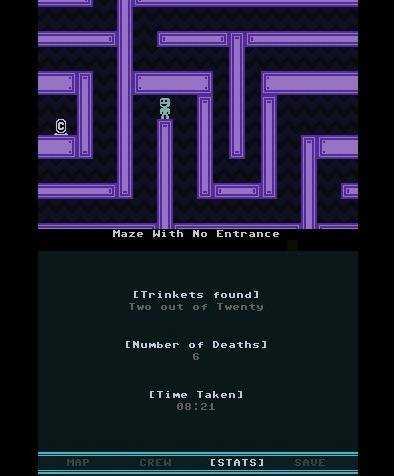 Does anybody know if Nicalis will still be providing VVVVVV with a DLC update? I guess we were supposed to receive a level editor and online leaderboards. Beautiful review SkywardL this game is so much fun! I love this game it's very challenging and fun. This review was a pleasure to read. I need to download this game sometime. This is one of the best games on the 3DS eshop!